No matter how much you go over your rig before leaving on a long RV trip, there is always the possibility of a little shop time along the way. 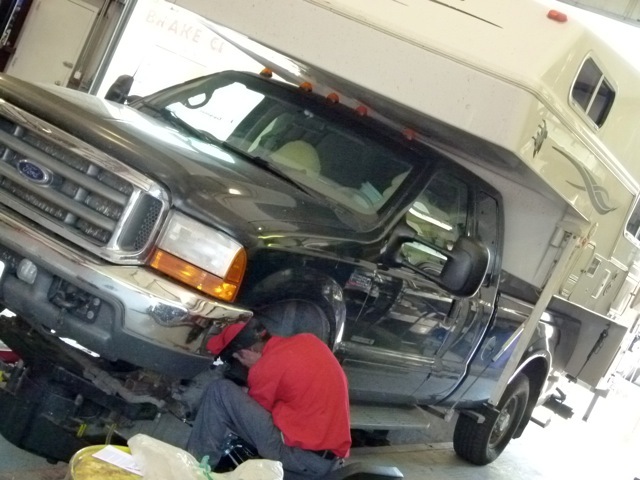 A couple of weeks ago, Jamie, our friend in Utah and an expert mechanic, did a 10-point check of our F-350 and alerted us to a couple minor items and uneven wear on our front tires. (The back tires were not showing any unusual wear patterns.) Keeping an eye on it, about a week later (when we were boondocking along some backroads in the Escalante-Staircase National Monument), we noticed the wear had accelerated to the point, given the rough dirt roads on which we were traveling, we felt we could no longer postpone purchasing new tires until we returned to Spokane. 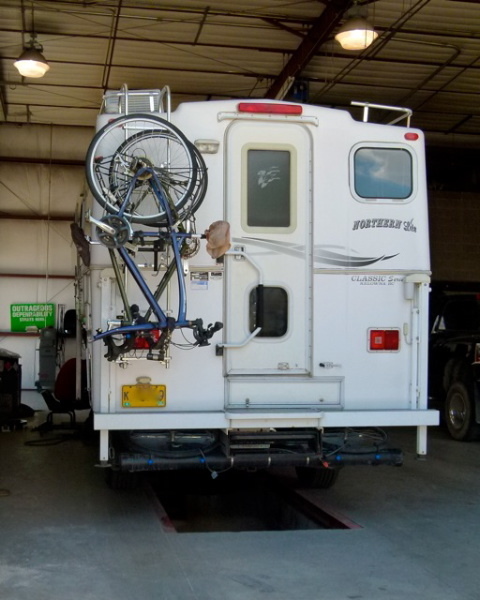 We had also asked Chip if they could do a front end alignment while we were there and he said ‘no’ because the shop did not have a high enough bay to be able to work on the truck while the camper was mounted. “Well, what if we take the camper off?” “No,” he said. 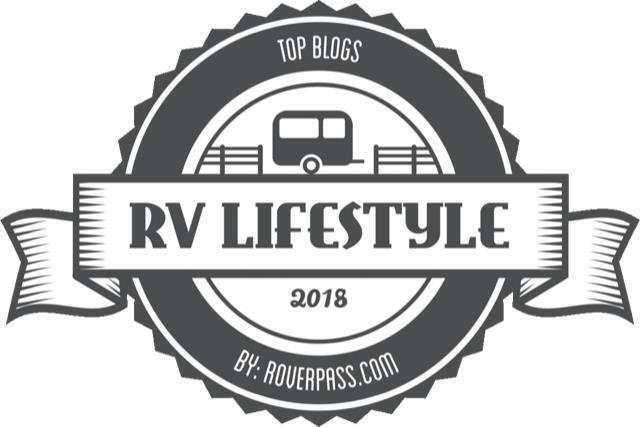 “If you put more miles on your truck with the camper on, we recommend you have it aligned with the camper on.” The rig should have the front end alignment done with the typical load. 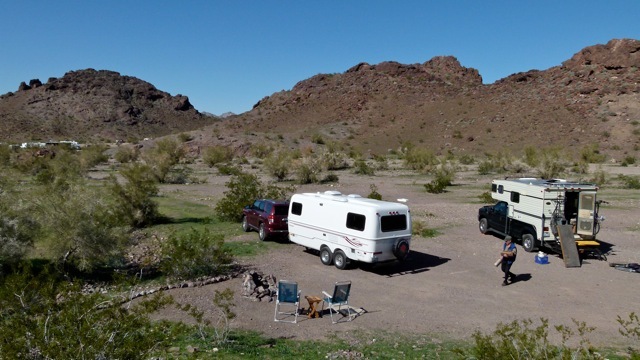 It was speculated that, because we purchased our camper at the beginning of this trip after its previous alignment, the added load of the camper changed the alignment, resulting in the uneven wear. Next step … finding a shop with high clearance bays between Moab and not too far along our route … maybe in Durango (our destination for a wedding) … or … maybe Grand Junction, Colorado. Back to researching on the internet. Amazing resource. 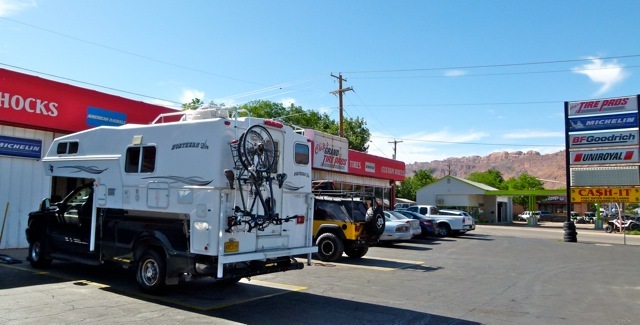 In Durango we found one tire center that did alignments, but they did not have high bays and said it “really did not make that much difference” having the camper on or off; but could not get to our truck until the following week, anyway. 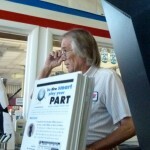 Sitting in a Wal-Mart parking lot on a hot Thursday afternoon in Durango, I started scouring the internet for shops in Grand Junction and found AA Automotive Diagnostics & Repair. I called them. “Yes” they did alignments, but “no” they did not have a high bay. Without hesitation, he recommended that I contact Scotty’s Complete Car Care Center because he knew they had the high bays. 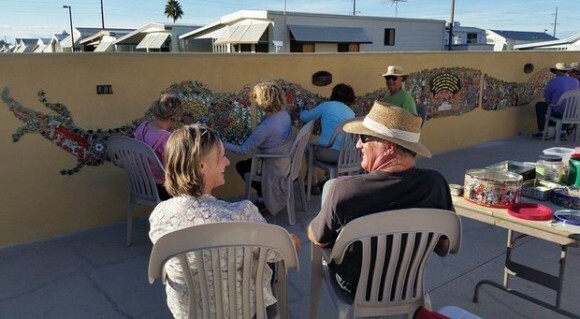 We got to Scotty’s at 8 a.m. on Monday and the parking lot was already packed. After talking with Dennis, he said they would take a look and give us a call. We headed off toward Main Street for breakfast. 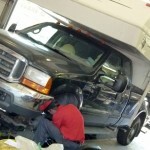 By 10:30 a.m. Dennis called and asked if we could return to the shop to discuss what they found. Turns out there were a few worn out parts, ‘this and that’ were loose and, bottom line, the front end needed to be rebuilt before they could do the alignment. I know, I can see you rolling your eyes. And, we might have done that too, had we not had our diesel expert friend, Jamie, point out a few items when he did his 10-point inspection. Also, the truck is 12 years old and it’s been down more than 128,000 miles, some of them rough, and most of them with a loaded camper on its back. We were back the next morning a little before 8 a.m., turned over our keys and headed out for breakfast again. We also found out that Dennis has run the department for the past 12 years, and watching him interact with customers, no one is a stranger. 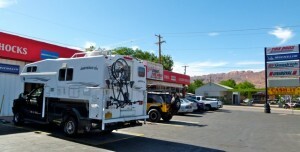 We returned to the shop after a late-afternoon ice cream to see our rig parked in the lot. Total bill for lube and oil change: $150.62; cost for front end work and alignment: $1,703.23. We were on our way north toward the Dinosaur Diamond region by 4:15 p.m.
Would we go back to Chip’s Tire in Moab and Scotty’s Car Care in Grand Junction — Yes. 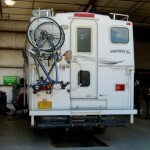 Would we recommend them to other fellow RVers out there on America’s highways in need of work on their rig. Definitely yes. They did everything with the camper on. 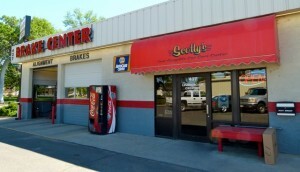 Wanted to ask if Scotty’s did the alignment with the truck camper on or off? 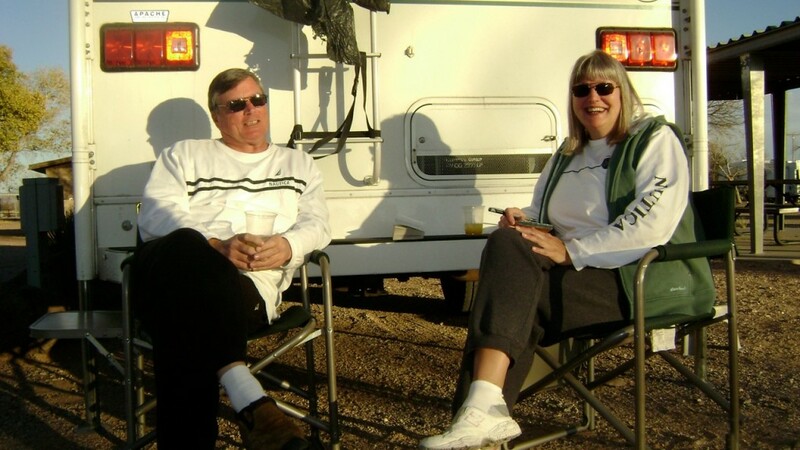 A month ago we picked up a 2008 Lance 915 Truck Camper and have now sold our 2011 Keystone 5-th Wheel Toy Hauler. Leaving mid-August for Tetons, Yellowstone & The Badlands!! Cannot Wait! !